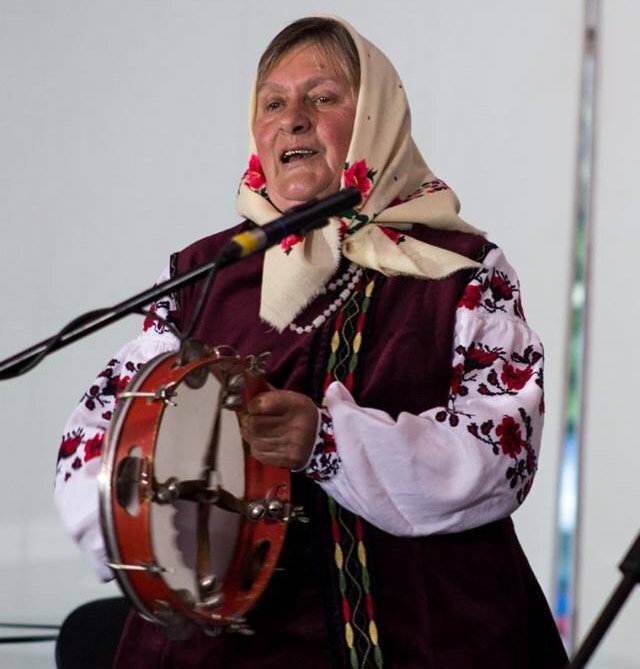 In the village of Luka, that in the Kyiv region, researchers have recorded about 300 songs of various genres. Oral tradition of the village has retained a special performing style, inherent in the Kyiv and Zhytomyr Polissia. Cossack songs were previously performed by male groups. This relict form of performance was documented by researchers in the region in the early 2000s. The oldest form of Ukrainian dramatic art was the vertep (folk puppet theater). For this art, the combination of a religious plot of satirical and household interludes was peculiar. Folk performing art is a sphere of artistic and creative activity, through which folklore pieces, in particular, songs, musical instrumental compositions, dances, stage works and games, are presented. Through live personal performance (individual or collective) separate art elements of oral creativity come to life in space and time and materialize themselves. Individual interpretation, improvisation and unique style of performance allow one to perform a particular piece of folk art in plenty variations. Verbal and musical forms of performance were embodied in folk song creativity. 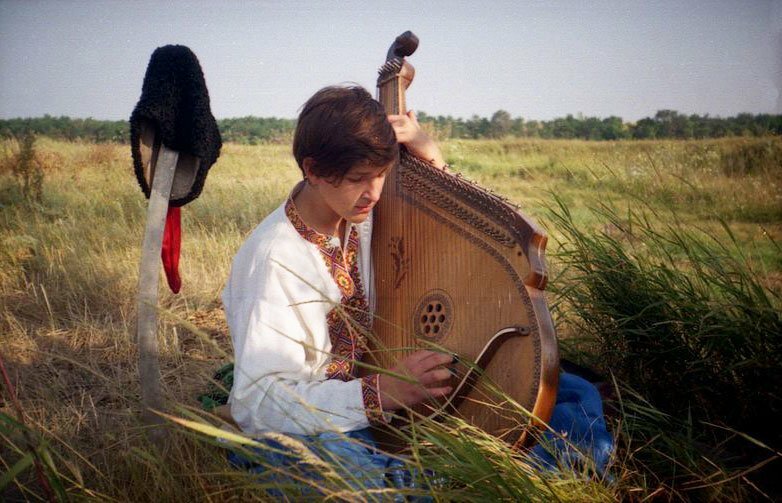 Genre and stylistic richness is inherent to Ukrainian folk songs. Family songs also include children's lullabies and funeral mourning songs. Each region of Ukraine has specific features of performing style and song repertoire. The dance belongs to the most ancient forms of folk performing art and has its roots in the times of the mankind origin. Scientists divide dances into those that had a ritual content and actual dances that were danced mostly during folk festivals. 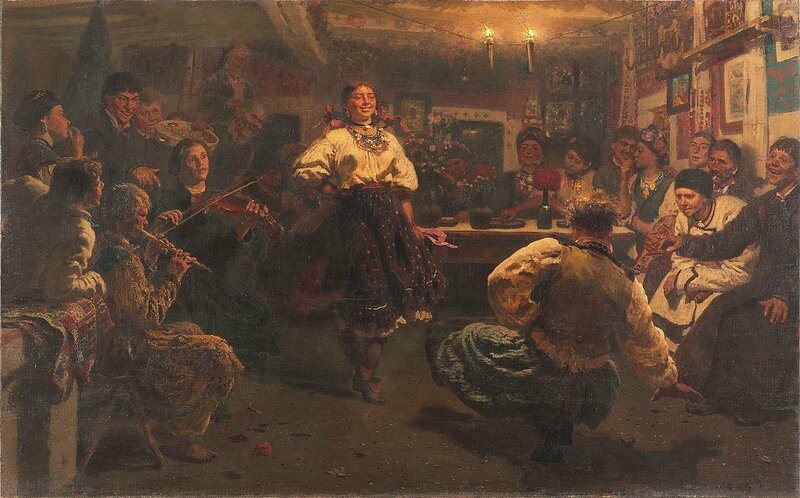 Dances were mainly performed by girls: these were dance songs during the calendar rites of spring (vesnianka, haivka and postova) and summer (Trinity, John the Baptist holiday and harvest holidays). Dances were not so rigidly connected to ceremonies and were generally of entertaining nature. Rhythmic, fast dances included krakowiak, hopak, kolomyyka, polka, metelytsia and kozachok. Ukrainian folk choreographic culture is now in a state of decline, many folk dances are now forgotten and at best performed by folk groups. Nevertheless, at the same time, folk dances form an inexhaustible source for the creativity of stage choreographers who use elements of folk dance in their performances. Folk games - an art form that combines elements of other types of folk arts, has its own drama and is accompanied with dances and songs. Often folk games were included in calendar and family ritual acts. The most famous ritual games include, in particular, Christmas ones - "Goat" and "Malanka". In the youth game "Malanka" the role of Malanka is usually played by a young guy, while other costumed actors included an old man, a Jew, a goat and a Gypsy. A senior, a so-called "birch", directed the whole youth festive group. 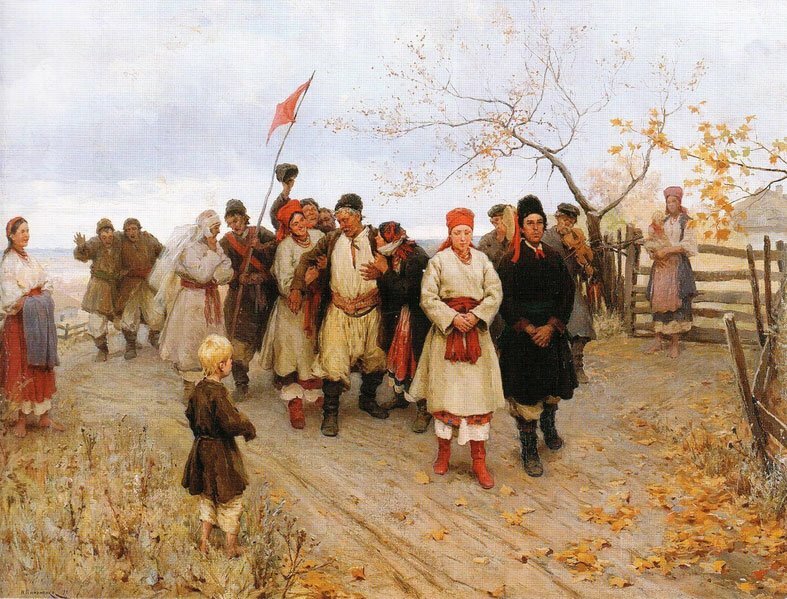 There were other folk ritual games - for example, youth festivals "Kalyta", which took place on Saint Andrew’s Day. Until now, in the villages there are games "Chickens" (also known as "Gypsies") – a comic game with disguises, which completed the wedding celebrations. The day after the wedding, guests come to the groom's house dressed as different characters: a doctor, a gypsy, a policeman or as brides and grooms. They go around the village and arrange various brawls and jokes, in particular, they try to steal some goods from the estate or chickens. In the evening everyone is invited to eat the "chicken" meal. Dramatic and theatrical art of Ukraine was formed under the influence of various types of song and dance folk arts, as well as games and rituals of the family and calendar cycle. A pronounced plot is present in Saint John the Baptist`s Day`s songs, dances and folk games. Dialogic speech is inherent to folk songs, as well as individual rituals (e.g., matchmaking or wedding). Separate ceremonies were performed by several persons, which created conditions for stage interpretations. 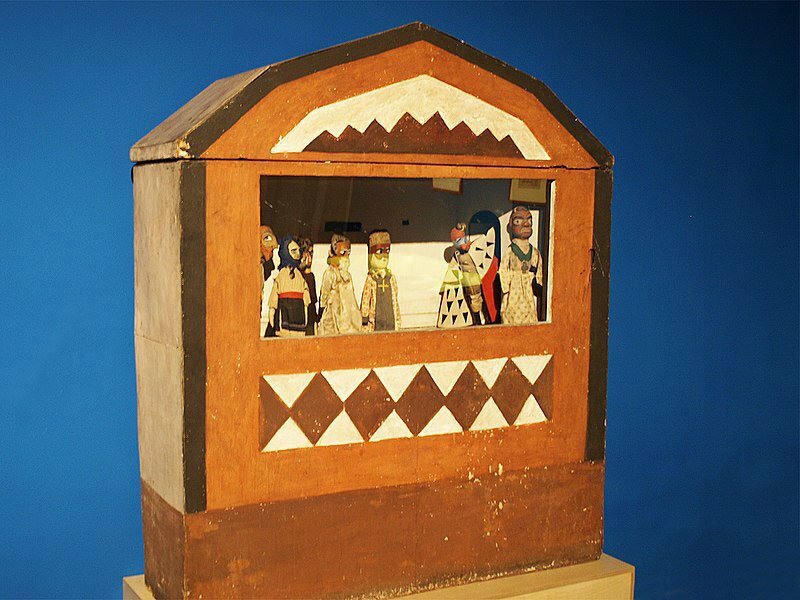 The Nativity scene (folk puppet theater) was one of the oldest forms of Ukrainian musical theater. It was known in Ukraine since XVI century. Nativity scenes, consisting of two actions, were prepared for the Christmas holidays. The first one reproduced the story of a religious legend about the birth of Jesus. The second part was of national character. For the Nativity Play, a theater prepared a two-story stage. The first religious scene took place on the top floor, and the second – household – on the lower floor. The villain-like characters of the Nativity scene included Herod, Death, Devil and a Roman soldier. A peculiarity of the Ukrainian Nativity Play was the combination of religious subjects and organically satirical and household interludes connected to it. Unlike the Western European Christmas theater, which was directly dependent on the Church, in Ukraine Nativity Play was combined with folk theater culture. Humeniuk A. Folk choreographic art of Ukraine. K., 1963..
Ivanytskyi I. Ukrainian musical folklore. Vinnytsia: New Book, 2004.